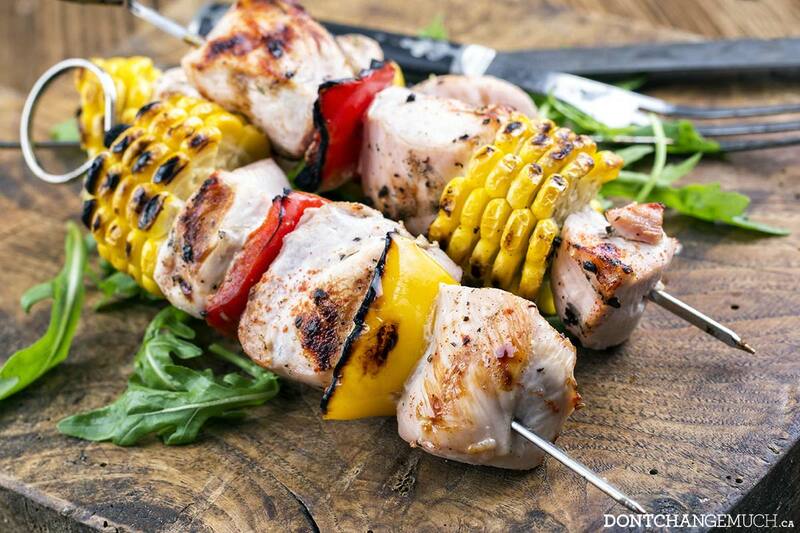 Be a legend on the grill like Bob Marley is to music, and impress your family and friends with this easy recipe for Jamaican grilled chicken and vegetable kebabs. This recipe is like a Caribbean vacation on a stick, complete with a Jamaican-inspired jalapeno marinade that packs the heat and is sure to satisfy your taste buds! Combine all marinade ingredients together and blend. If you do not have a blender, mix all ingredients together in a small bowl using a fork. Cut chicken into 2 inch cubes and throw in a zip-tight plastic bag with marinade. Refrigerate for at least 15 minutes. While the chicken is marinating, rinse and chop red peppers and onions into large pieces. Shuck corn and chop into 1-inch wide pieces (see picture above). Toss vegetables with 1 tbsp olive oil in a small bowl. While the barbecue preheats, skewer the chicken, red pepper, onions and corn. Cook kebabs for a total of 10 minutes, turning once, until chicken is no longer pink inside. Pro Tip: If you’re using bamboo skewers, soak them in water for at least 20 minutes prior to grilling to prevent them from burning. Thanks for the recipe! I am going to start marinating my chicken this morning. Awesome, Wendy! Glad you like the recipe.